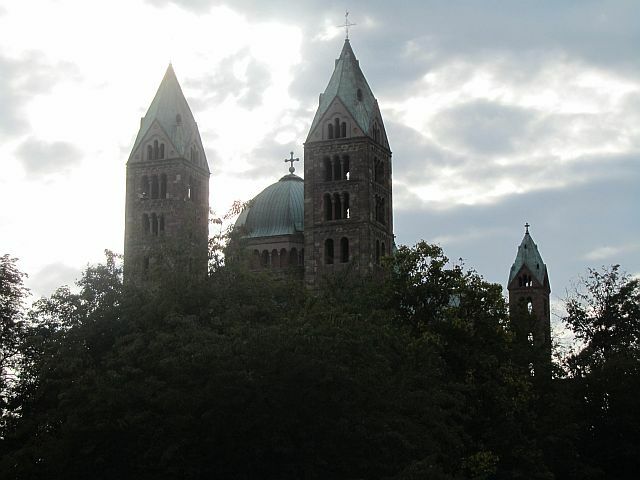 Speyer is a city of the Rhineland-Palatinate with a current population of about 50,000. 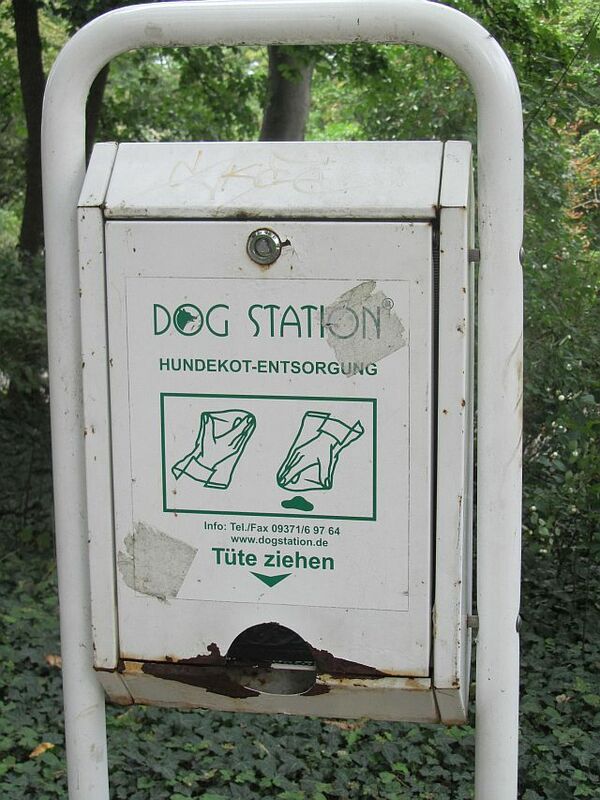 It is advantageously located along the Rhine River which at 1,232 km is the longest in Germany. A UNESCO World Heritage site the Rhine River is itself historically fascinating and is a commercially and recreationally busy river. Along with the Danube it formed most of the northern interior frontier of the Roman Empire. Founded by the Romans as a fortified camp around 10BCE, Speyer is one of Germany’s oldest cities. However, long before the Romans established a fort in Speyer’s vicinity others as long ago as 5000 years had seen the locational advantages. The relatively flat area here has high banks which keep fields, dwellings, etc. safe from flooding, yet it is on a major river and all the benefits that go along with that. A diocesan town in 346, Speyer was already beginning to show its importance, but it took a Salian from the Speyer district to be elected King of Germany for it to really get a boost up the status ladder. With the election of Conrad II in 1024 Speyer was drawn into the centre of imperial politics and became the spiritual hub of the Salian Kingdom. More upward mobility occurred in 1294 when Speyer joined the élite circle of Free Imperial Cities, although the Bishops of Speyer probably had their noses out of joint about that as it effectively ended their 325 year control of the city. wrangling. It also figured prominently in many events such as being the site for the extradition of Richard the Lionheart to Henry VI, Holy Roman Emperor, in 1193. 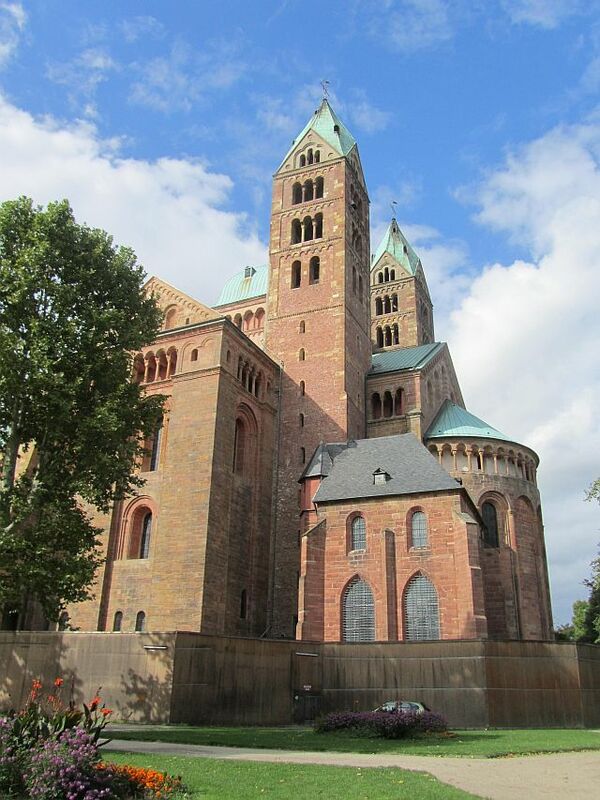 Speyer is another city that has managed to keep its medieval city core largely intact. Despite its prominence and therefore, a juicy target, it came through many takeovers relatively unscathed, even escaping the bombing raids of WWII. When Conrad II was elected King he immediately set about commissioning a Cathedral, a massive red sandstone triple aisled vaulted basilica. An immensely ambitious project begun in 1030, its construction and reconstruction would continue into the 19th Century, although its basic structure was complete in 1061, the year of its consecration. It is undergoing another restoration project at the moment, one that won’t be completed until 2015. 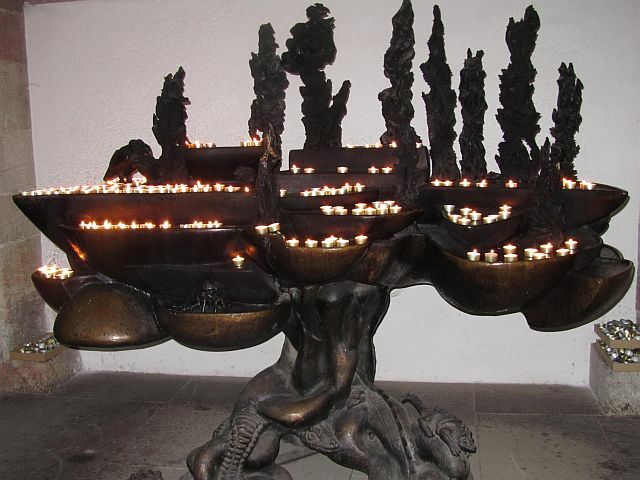 Although the Cathedral has undergone many facelifts the crypt is in its original state. Speyer is dominated by the Kaiserdom zu Speyer (Imperial Cathedral of Speyer), the seat of the Roman Catholic Bishop of Speyer. Regarded as a symbol of imperial power it is the burial-place of eight (Salian, Staufer & Hapsburg) Emperors and Kings, assorted wives, one girl child, several bishops and a bunch of unidentified bones tossed into a stone coffin. They lie in the crypt beneath the main altar. Conrad II did not live to see the completion of the Cathedral by a long shot, but he was the first one buried there. 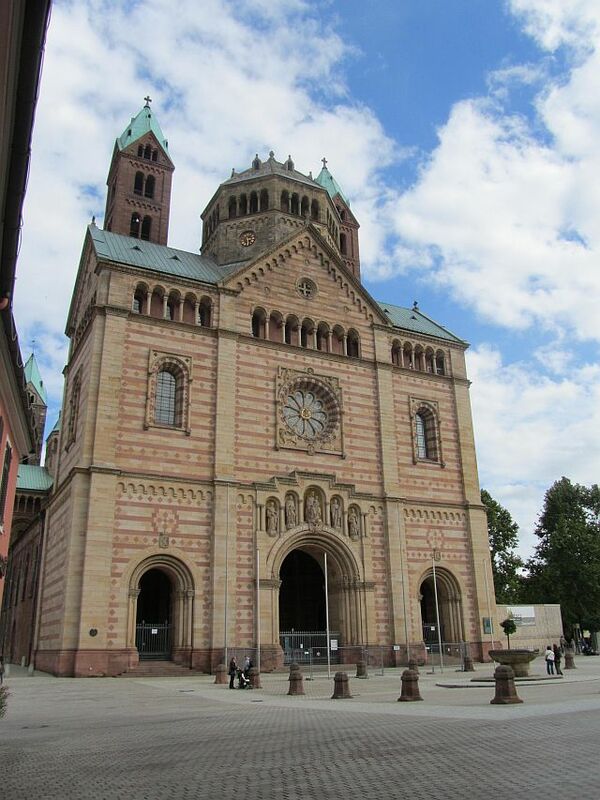 Pope Pius XI raised the Speyer Cathedral to the rank of minor basilica of the Roman Catholic Church in 1925, and in 1981 it was added to the UNESCO World Heritage list as a major monument of Romanesque art in the German empire. It is the largest and one of the finest Romanesque churches today. It was another lovely day when I arrived in Speyer, but I was a bit anxious. Speyer is the only place I have been where I did not have a room booked in advance. Because it is larger than the other towns on the pilgrimage route the only listing in the wee guidebook was for a hostel – a big hostel – not my kind of thing. However, I knew that tourist information centres had listings of accommodation and trusted that I would find something through them. 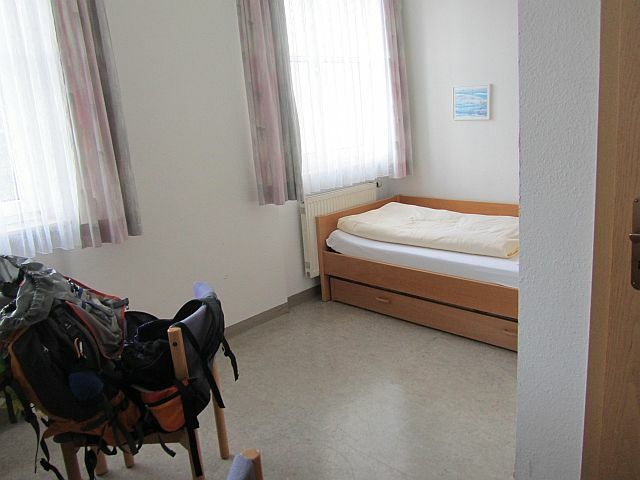 I was very pleased when not only was a room found for me that was in keeping with my budget, but it was within five minutes walk of the Altstadt, ten minutes to the Speyer Cathedral and fifteen minutes to the Rhine. And, bonus the gal at the tourist information booked it for me. My accommodations were clean but austere, almost like a monk’s cell which was probably not too far off as the establishment was owned by one of the churches. Since I had arrived with plenty of the day left for exploration, my first outing was to the Speyer Cathedral – the end point of the Rothenburg ob der Tauber to Speyer pilgrimage. homing pigeon – a homing pigeon with issues. They aren’t kidding when they say Cathedral dominates the city. A basilica with four towers and two domes, it is Mammoth! Its basic dimensions are: length 134m, width 43m, and height of towers (eastern) ~71m and (western) ~66m. (I’ve rounded the figures up or down). Despite those impressive dimensions it is not Germany’s largest church. That honour goes to the Cologne Cathedral. Whose length is ~145m, width ~87m, and height of the two towers ~157m. Mini digression: The Cologne Cathedral is a Gothic masterpiece. Begun in 1248 and finished in 1880, it became a UNESCO World Heritage site in 1996. Unlike Speyer, Cologne was pretty much flattened during the bombing raids in WWII, but incredibly, despite taking seventy bomb hits the Cathedral did not collapse – awesome construction, or, puny bombs. I’ve been to the Cologne Cathedral three times and it remains one of my favourites despite its size. Oddly enough, although the Cologne Cathedral is larger and taller it does not seem as massive as the Speyer Cathedral. The Cologne Cathedral is sort of airy – largely due to the lacy fretwork style of the towers, the Speyer Cathedral hunkers and looms. Since the Cathedral is undergoing restoration it is almost devoid of interior adornment. At the time, I didn’t know about the restoration, although scaffolding at the far end should have been a clue. I figured that “they” had run out of money after the construction and didn’t have a penny left over for fancy stuff, which seemed highly unlikely. 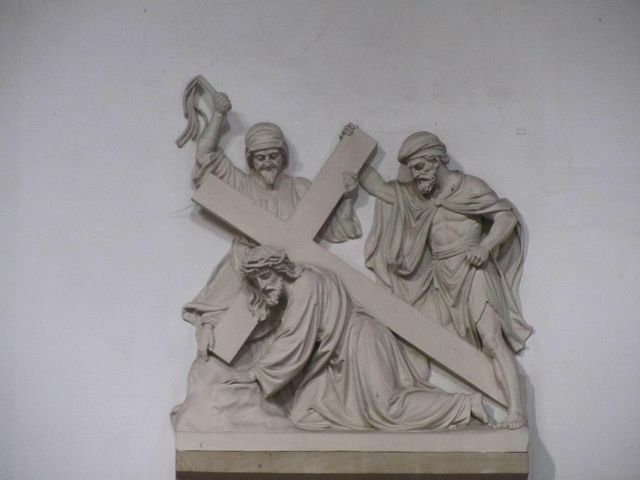 The only decoration is a series of paintings high on the walls and almost as many relief sculptures lower down on the walls – these depict Christ his crucifixion and arising, etc. There is no question that it is an amazing work of architecture, but I couldn’t shake the feeling that it was built to the glory of humankind in the name of God. It is so vast you feel swallowed in insignificance. There is an impersonal and distant type of energy within. 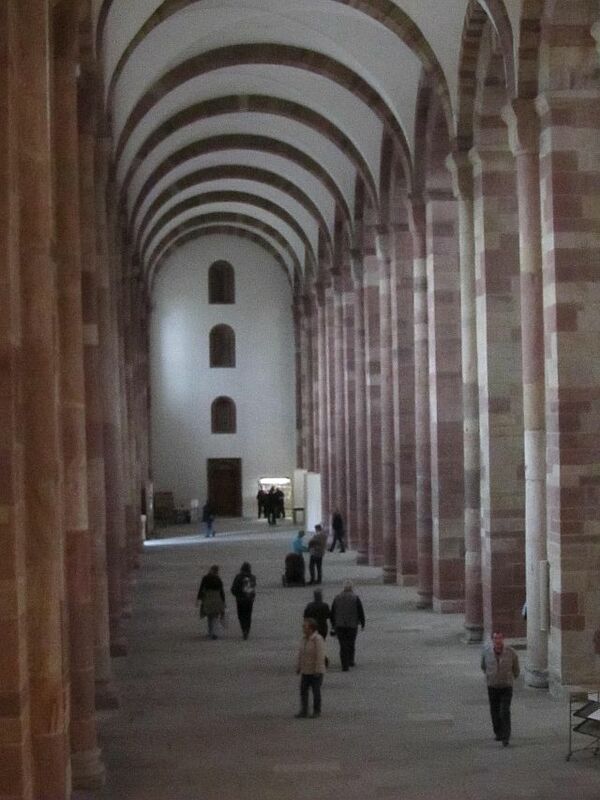 Unlike the other churches I had been in the Speyer Cathedral inspires no silence let alone silent contemplation, but to be fair the industrious sounds of hammering and sawing, etc. probably had a lot to do with that. As well, it is so massive that heating it must be an enormous expense. It was cool in the fall; I can imagine it must be frost cold in the winter. No warm embrace here. Nonetheless, the Cathedral is well worth seeing. 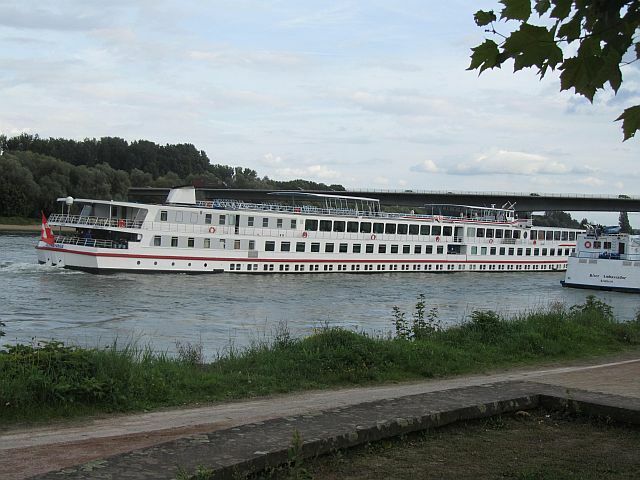 I spent several hours the next day down by the Rhine, until the cool chased me indoors. Sure was good to be by the water again. 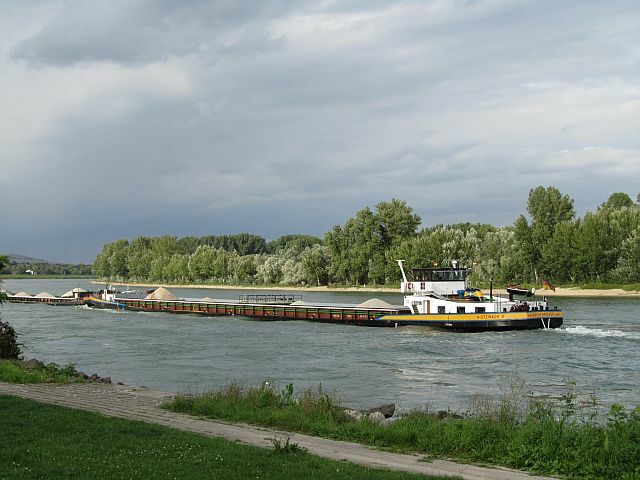 I knew the Rhine was a commercial as well as recreational river, but I was surprised by extent of the traffic; e.g. numerous barges with all manner of goods; cars, lumber, giant parts of something, etc., tour boats – some very large, motorboats, the coast guard, even an intrepid kayaker. There is a long wanderweg along the river as well, but I had had enough of walking for a bit, and just enjoyed the interesting activity. Speyer is in a beautiful locale. As near as it is to a large river the area is relatively flat but with a good deal of greenery around. 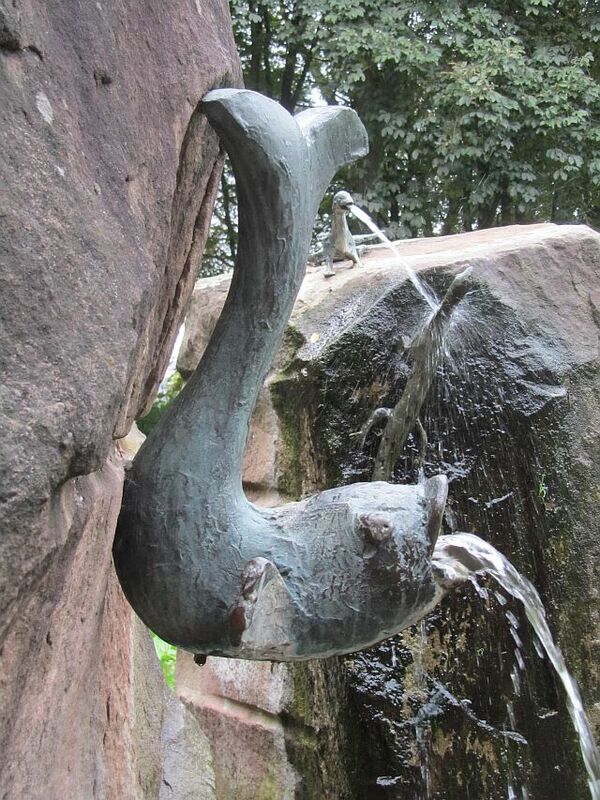 The Rhine valley is known for its wine production and Speyer is one of the cities along Germany’s wine route. Good chocolates too. I would visit again and check out its outlying areas as well. 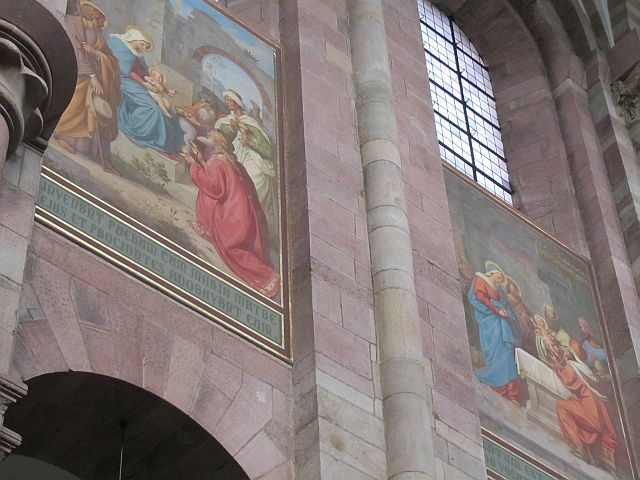 In fact 2011 would be a good year to go as Speyer is celebrating three very historically important events. A) 950 years since the consecration of the Cathedral. B) 900 years since the coronation of Emperor Henry V (the last Salian ruler). C) 900 years since its citizens received certain rights as a first step to becoming a Free Imperial City. From Speyer I went back to Altendiez for good company and a pause in my travels. I have already written about Altendiez so my next update will be about Büsum. In case you weren't sure how to do it.